The latest version of SkyView has a new capability for drawing overlays on SkyView images. One major use of this will be to allow us to provide templates of the fields of view of various telescopes. E.g., in the image below we’ve overlaid information on the fields of view of two of the instruments of the Swift observatory on a simple DSS image of the region around 3c273. 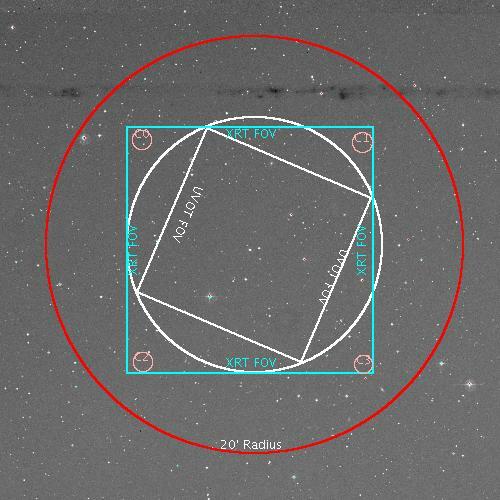 The X-ray Telescope (XRT) field of view has calibration sources (C1-4) marked in the corners, while the UltraViolet-Optical Telescope (UVOT) has a large rotation (and small offset) with respect to the satellite’s nominal pointing. This entry was posted in Notices and tagged FOV, Plotting, Swift. Bookmark the permalink.